Most of you have probably heard of iTunes U. iTunes U is an app created by Apple where faculty and staff can post course content for free. Anything from recorded lectures, podcasts, video clips, homework assignments, readings, etc. can be listed on iTunes U. The best part is that these materials become available to anyone with the app- not just the students taking the class. How can you use iTunes U in ResLife? The better question is how can’t we use it! There are SO MANY “courses” available. It’s a great way to get materials for a staff training session, a door to door program, social program, newsletter article and more. You could also create a course on the app and list materials for your staff or students to access. Have you found a creative way to use iTunes U in your work? The two featured apps in this blog post allow you to tell your story with some flare. SpicyNodes allows you to create interactive features on your website that invite visitors to interact with your content. Flowboard allows Apple users to create, share, and present visual stories that can be shared on the web. The work from both of these apps is stored in cloud, allowing for anywhere, anytime access to the materials. Spicynodes is a web-based tool that allows you to create an interactive concept map that can include information about your department, division, or group. Each node on the map can include information, images, videos and links. The visual nature of the concept map encourages website visitors to explore the content. Spicynodes are stored in the cloud, giving you embed code to include in your website or blog. This enables changes to the main Spicynodes map without having to change your website. Some interesting uses of this tool within Student Affairs: a visual depiction of the division of student affairs, how to navigate the student conduct process, a presentation with links on how to apply for housing (including images of the dorms and dorm room types). Flowboard is an iPad app (Android users—no updates yet on when this will be available for you) that allows you to take images from Dropbox, Facebook, Google Images, Box, and Instragram and create really beautiful image galleries. Users can add buttons, videos, and captions to create an interactive experience for website visitors. Once created, you can share the Flowboard URL on a website or a blog. This tool is great for creating rapid galleries around an event where you have a series of images captured on Instagram or other social media tools. Additionally, the Flowboard published file can be accessed offline on an iPad to be utilized for presentations. Imaging having an event where you take pictures the first hour. The images can be quickly uploaded to Flowboard and become a rotating image gallery that can be displayed throughout the remainder of the event. The Flowboard tools will make the presentation look polished and professional. What tools are you using to add bling to your websites or blogs? Please share with links in the comments section below. – Dr. Jennifer Sparrow is the Senior Director for Networked Ventures and Emerging Technologies. She works with all departments at Virginia Tech to match emerging technologies with the learning, research, and outreach goals of the university. Have you heard about 8-Bit? 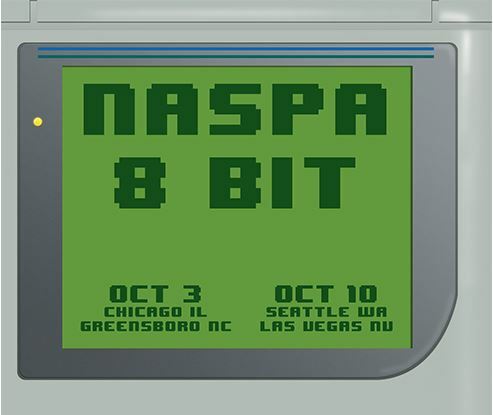 This past week, NASPA announced a new conference called 8-Bit, and we at the NASPA TKC are VERY excited about it! Two speakers, two locations. 8-Bit will feature two leading thinkers at each conference who will get the creative juices going with an inspiring talk before getting the discussions underway on-site. Syncronous and asynchronous format. Attendees will take part in brainstorming sessions between the two locations as well as with the person right next to them. Don’t worry though, you won’t miss anything! No matter which topic you’re most interested in you’ll be involved, regardless of your location. Engagement. If you’re planning on just taking notes and listening in the back of the room, think again! 8-Bit will challenge attendees with thoughtful group discussions requiring participation from every person there. Actionable. Discussing theory is great, but we want you to leave 8-Bit with a list of items that you can begin implementing the minute you’re on campus. At the 2013 annual conference for the Canadian Association of College and University Student Services (CACUSS), Hamza Khan and I began our discussion of technology in student affairs with a clip from Sherry Turkle’s TED talk “Alone Together”. You can view the full talk here . Sherry’s talk covers many ideas and sparks even more questions. In particular, our session participants began a lively and ultimately insightful discussion about identity and identity development in the digital space. There were “horror stories” about students who had openly and (very) publicly shared pictures or words that predictably made a room of student affairs professionals cringe. There was debate around whether professionals should ‘friend’ students on Facebook or follow them on Twitter. There was a request for successful practices in supporting students after they have made a public “mistake” in their social networking. The use of social media by our students, and if we’re very honest, by ourselves and our colleagues, has created what Sherry calls an “identity workshop”, a place for identity experimentation, “for trying out aspects of self that were hard to experiment with in the physical realm.” Feedback on experiments in this identity laboratory is instant, timely and, most often, copious. While perhaps not totally analogous to the more traditional scientific method we were taught in grade school, identities become hypotheses on the Internet, allowing for trial and error to occur at breakneck speed. What does this mean for those in the middle of identity development? (Hint: that’s everyone, at any moment, all the time). Does the speed at which we try on pieces of our identity matter? Can we learn from mistakes when they can, in theory, be so easily erased? While perhaps still enduring in the infinite cyberspace, the adage ‘out of sight, out of mind’ is even more apt with the simple click of a mouse and the deluge of new information ready to cover our digital tracks. One major challenge with this identity laboratory is just how public our experiments in identity are. Unlike laboratories made of brick and mortar, there are no obvious caution signs or heavy doors barring entry for anyone except those specially trained and carrying letters behind their name. Anyone and everyone in the digital world is a scientist, testing theories and drawing conclusions based on evidence gathered from a series of experiments. We demand a special level of rigor for scientific study in medicine – but do we expect this same high standard in the identity lab? How strict must our standards be in this privileged space of opportunity, where we can watch, in real time, students and colleagues form an identity from a collection of evidence and theories? If you were writing an experimental procedures manual for identity development, what would you include? More importantly, do we need such a guide at all? – Lisa Endersby is the Manager, Student and Campus Life at Seneca College in Ontario, Canada. She is also working to connect and engage NASPA technology friends and fans in her role supporting Community Engagement in the NASPA Technology Knowledge Community.